Assigned status Up to Date by Cat Nguyen Burkat, MD FACS on March 3, 2016. HIV-associated lipoatrophy, which includes fat loss of the limbs, buttocks, and face, has been closely linked to the use of the thymidine nucleoside reverse-transcriptase inhibitors stavudine and zidovudine. The lipoatrophy can have severe psychological effects and is also associated with increased risk of metabolic disorders and cardiovascular disease. Cessation of the causative drugs usually does not result in noticeable improvement of the lipoatrophy. A syndrome of peripheral lipoatrophy affecting HIV-infected patients was first described in 1998, coinciding with the introduction of highly active antiretroviral treatment (HAART) . Fat is lost from the limbs, buttocks, and face . More severe lipoatrophy is correlatd with cumulative drug exposure . Although there has been a significant reduction in lipoatrophy incidence with the decreasing use of stavudine and zidovudine over the last decade, the persistent nature of established lipoatrophy, with only minimal improvement after switching or removing NRTI drugs , has ensured that the syndrome remains prevalent. Exposure to stavudine and/or zidovudine. The protease-inhibitors have been implicated to a lesser extent. 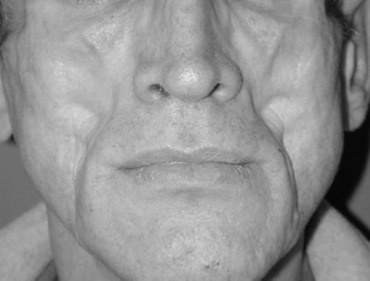 Patients have symmetrical facial fat atrophy. Because lipoatrophy is independently associated with metabolic disorders, including dyslipidemia, insulin resistance, and increased risk of cardiovascular disease, the patient should be screened for dyslipidemia and diabetes. Poly-L-lactic acid and calcium hydroxylapatite are injectable fillers that have been FDA approved for the treatment of facial fat loss in patients with HIV. Bilateral orbital floor implants can treat enophthalmos. HIV-associated lipoatrophy has been shown to persist after 5 years of follow up, with little recovery regardless of whether the implicated drugs were discontinued . The use of injectable facial fillers can help patients normalize their appearance. ↑ Carr A, Samaras K, Burton S, et al. A syndrome of peripheral lipodystrophy, hyperlipidaemia and insulin resistance in patients receiving HIV protease inhibitors. AIDS 1998; 12:F51-F58. ↑ James J, Carruthers A, Carruthers J. HIV-Associated Facial Lipoatrophy. Dermatol Surg 2002; 28:979-986. ↑ Mallal SA, John M, Moore CB, James IR, McKinnon EJ. Contribution of nucleoside analogue reverse transcriptase inhibitors to subcutaneous fat wasting in patients with HIV infection. AIDS. 2000;14:1309-16. ↑ 4.0 4.1 4.2 4.3 4.4 Hammond E, McKinnon E, Nolan D. Human Immunodeficiency Virus Treatment-Induced Adipose Tissue Pathology and Lipoatrophy: Prevalence and Metabolic Consequences. HIV/AIDS. 2010;51:591-9. ↑ Wohl D, Scherzer R, Heymsfield S, Simberkoff M, Sidney S. The Associations of Regional Adipose Tissue with Lipid and Lipoprotein Levels in HIV-Infected Men. Journal of Acquired Immune Deficiency Syndromes. 2008;48:44-52. ↑ De Witt S, Sabin CA, Weber R, Worm SW, Reiss P. Incidence and Risk Factors for New-Onset Diabetes in HIV-infected Patients: The Data Collection on Adverse Events of Anti-HIV Drugs (D:A:D) Study. Diabetes Care. 2008;31:1224-9. ↑ De Socio GV, Parruti G, Quirino T, Ricci E, G S. Identifying HIV patients with an unfavorable cardiovascular risk profile in the clinical practice: results from the SIMONE study. Journal of Infection. 2008;57:33-40. ↑ 8.0 8.1 Introcaso CE, Hines JM, Kovarik CL. Cutaneous toxicities of antiretroviral therapy for HIV: Part 1. Lipodystrophy syndrome, nucleoside reverse transcriptase inhibitors, and protease inhibitors. J Am Acad Dermatol. 2010;63:549-561. ↑ 9.0 9.1 Grunfeld C, Saag M, Cofrancesco J Jr, et al. Regional adipose tissue measured by MRI over 5 years in HIV-infected and control participants indicates persistence of HIV-associated lipoatrophy. AIDS 2010;24:1717-26. ↑ Crane HM, Grunfeld C, Harrington RD, et al. Lipoatrophy among HIV-infected patients is associated with higher levels of depression than lipohypertrophy. HIV Med 2008;9:780-6. This page was last modified on March 12, 2018, at 16:39.